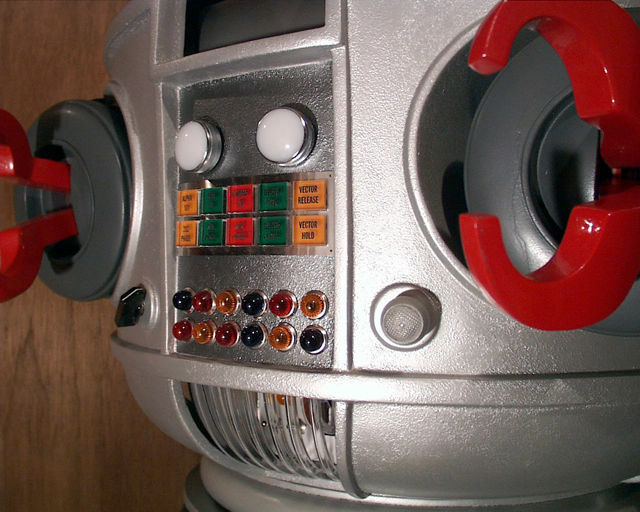 Despite his appearance on Lost in Space, the original B9 robot definitely did not have a smooth finish on his torso or treadsection. It's possible to achieve a very similar finish on a replica using products available at craft stores. 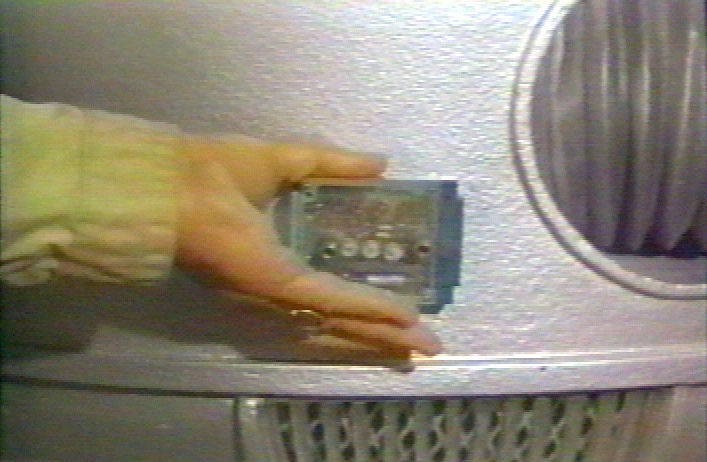 These instructions use the torso as an example, but the same steps are involved in giving a texture finish to any other robot part. Start by making sure you have no flaws in the surface. While the texturing will hide small imperfections, it won't mask glaring mistakes. After the surface is primed, spray on one coat of Plasti-Kote Fleck Stone faux granite finish. This is a water-based product, so it cleans up with just water. That's a good thing, because the stuff flies everywhere! Be sure to mask off and cover anything nearby that you don't want to have a faux finish. Spray in short sweeps and short bursts. You want to achieve even coverage, but let about 50 percent of the primer show through. The product has a tendency to collect in corners, so it's a challenge to go back and even out thin spots without building it up in other spots. Practicing on another object would definitely be helpful. 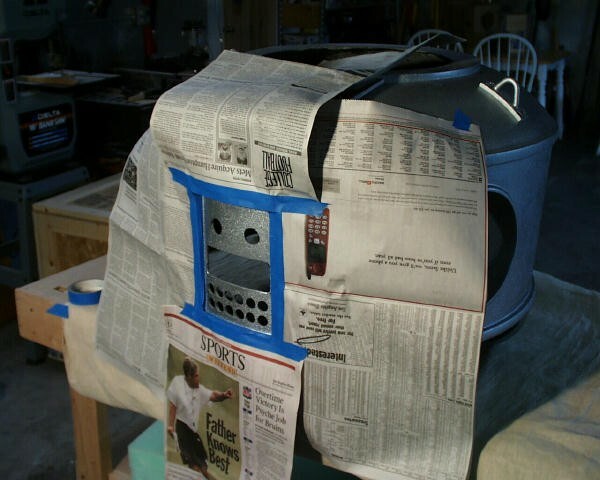 Once you have a satisfactory coat sprayed on, let it dry overnight. The Fleck Stone stays wet for a long time, so for heaven's sake don't touch it! The next day, lightly hand sand everything down with a medium grit sandpaper. The object is to flatten down the surface to eliminate peaks and points. Don't rub too hard, or you'll take all the Fleck Stone off and have to touch up that spot. Be careful around raised trim, but be equally careful to get in the corners so the surface is as uniform as you can make it. 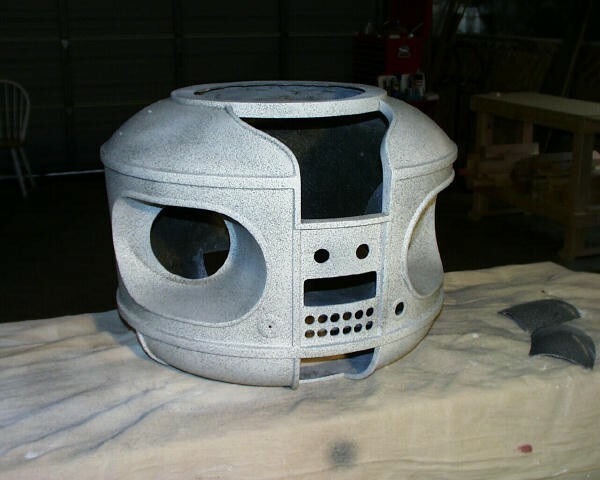 When you're done sanding, vacuum the whole thing off using a brush attachment and spray on a coat of primer to seal and provide a base for the paint. When the primer is dry, apply a light coat of your silver paint. Let this dry and then repeat your sanding routine. This time you can bear down harder, because the paint will further seal the texture and create a hard surface. Flatten down the bumps as much as possible without making it completely smooth, although you'd be hard pressed to smooth it out completely. You're aiming for something like the peel of an orange. After this second sanding, vacuum the surface, spray on a second coat of silver paint, and repeat the sanding. You'll find that each time you repeat this, the surface will get better. You can also move to a finer grade sandpaper if you want. On about the third cycle of sanding and painting, you should get a texture like the one in the photos. When you're satisfied with what you see, you're done sanding. Put on the final coats of paint, and then stand back and admire your work. If you're doing a second or third season paint scheme, you'll mask off the chest area and paint with a charcoal color. Now you've got a robot with an authentic finish that won't show the fingerprints of awe-struck admirers!